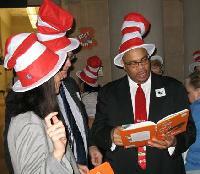 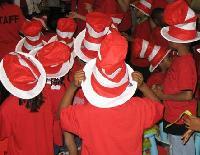 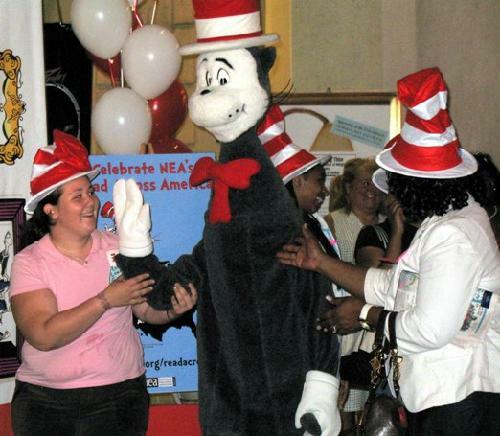 Held this morning in the Main Lobby of the Central Library, the National Education Association 's Dr. Seuss-themed Read-In was a huge success, featuring a surprise appearance by the Cat in the Hat . Michael Marks of the National Education Association Executive Committee rehearses a dramatic reading of Green Eggs and Ham to warm up the crowd. Young fans anxiously wait for a glimpse of the star. The Cat in the Hat is ushered onstage by members of his entourage.